Going to Birmingham is always fun. We get to visit with Wayne's Aunt Helen and his cousin, Lynn and her husband, Jay who are true foodies, executive chefs and we get to enjoy the fruit of their labor. On Saturday, we all gathered at Helen's to watch the Auburn / Texas A&M football game that Auburn lost but had a great time anyway. Lynn, Jay and Helen are reluctant Auburn fans as their daughter (granddaughter) attends Wayne's fine alma mater but they all went to that other Alabama college, the University of Alabama. Lynn and Wayne who proudly wears his Auburn University orange shirt. Couldn't resist getting this picture of Lexie and Ozzie at Helen's house. One afternoon, Helen, Wayne and I took Lexie, Ozzie and Helen's shiz tsu, Dusty, to a nice walking park near the baseball stadium in downtown Birmingham. 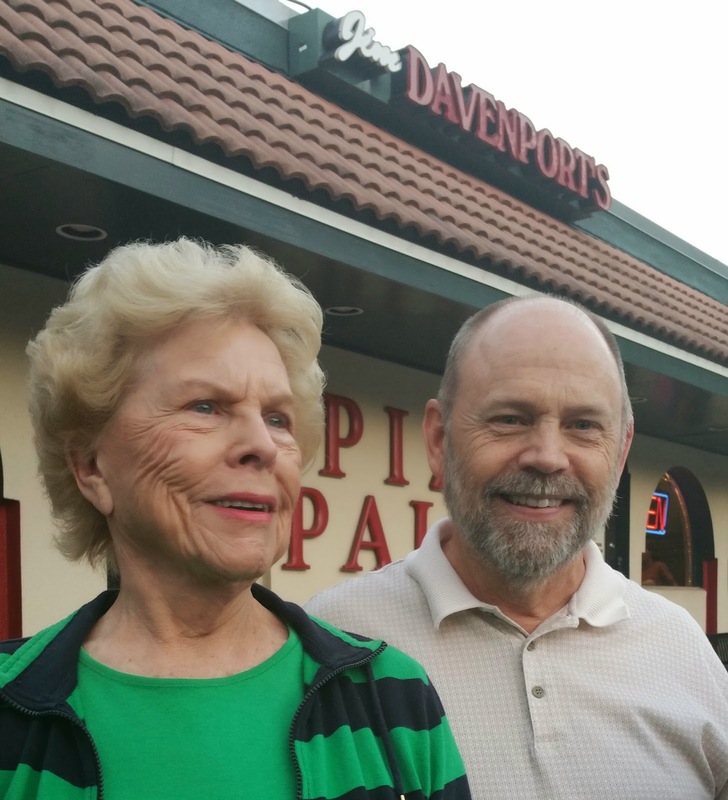 After the walk, we picked up a pizza at Jim Davenport's Pizza Palace. It was heavenly. Jim Davenport, the famous baseball player, is from this area and knew a few of Wayne's father's family members. Another afternoon, we took a drive down memory lane as Wayne so enjoys doing when he visits Birmingham. Wayne's father grew up here and Helen remembers all the old family haunts. She helps find the old places. The afternoon wasn't complete without a quick drive by Vestavia Country Club. Another great outing. The school where Wayne's father and his brothers attended was especially handsome. We didn't get out to walk the grounds or see the football stadium, but enjoyed a tour from the car. Later we learned the school was going to be used in a movie set. That's why it looked so good. Hummmm. No trip to Birmingham is complete without a visit to the family graves. We visited the graves of Wayne's grandparents, his father, Uncle Roy and Helen's parents. Helen, me and the dogs near Wayne's dad's grave. The last full day in town, Wayne drove to Green Springs and looked up his old friend and former boss at Auburn, Brad Ashmore. 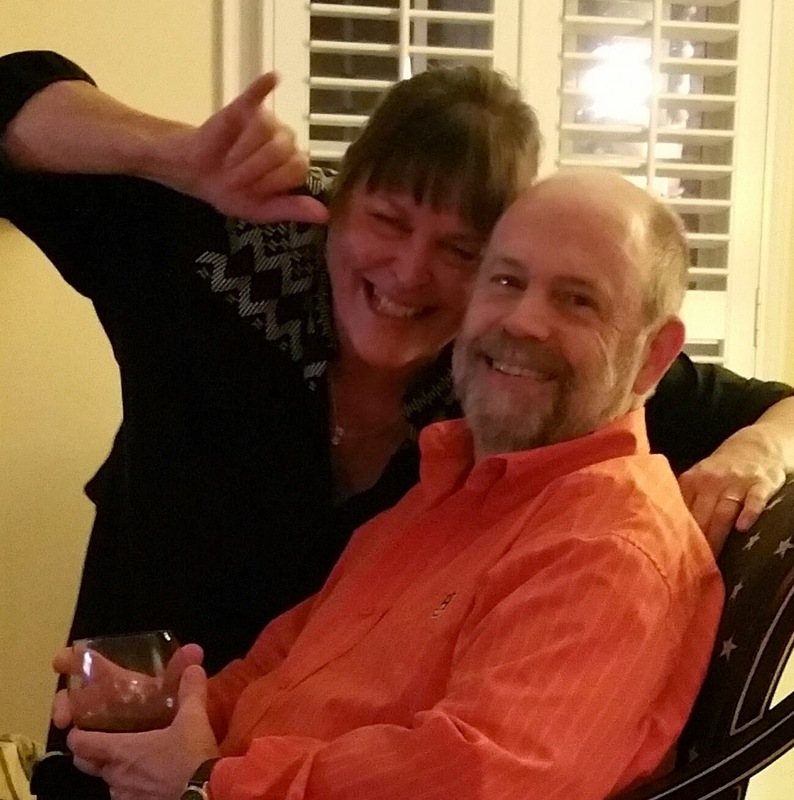 It had been more than forty years since they'd seen one another and they clearly enjoyed a few hours or reminiscing. After much deliberation and frequent discussion of the pros and cons, we decided to forego going on to Auburn for the final home game against Samford. It would be sandwiched by games at Georgia and at Alabama. We stayed a total of 5 days in the Hoover RV Park before heading south to the Gulf coast.